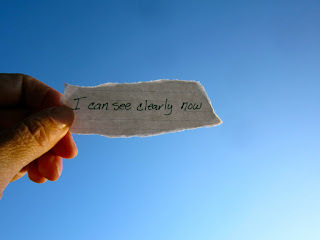 RussJones.Us: I Can See Clearly Now! Not that I'm trying to spiritualize this song, I'm not. But there is a truth here that I want to share with you. There are times in your life that you cannot see what God has in store for you. Often times we blame God for this lack of vision, "Well, He hasn't told me." But I believe that it's more about us. We are afraid to know what is coming next because it might be bad news. When we settle our hearts and listen, the rain goes away, and we can see the obstacles that are in our way. Prophecy can be about telling the future. But it's more about telling the truth in the present. It doesn't take much foresight to know that you will need Jesus in the coming days of your life. You will need His guidance and power. Life without Him is hopeless. So tell the truth to yourself now, quite your heart to listen to His voice and follow His lead into the future He has planned for you.